Because of Dave’s, and your generosity and hard work, CCCSDC 2018 Adopt-A-Family program was able to warm the lives of an incredible 119 Dutchess County families, comprising 409 individuals. 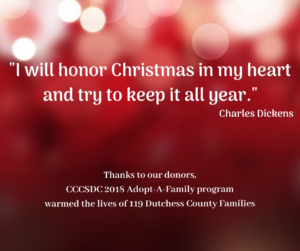 96 donors joined Rosa and other CCCSDC staff and volunteers to make this happen. Thank you all! Remember, by participating in our ongoing St. Nicholas program, Christmas can indeed be honored in our hearts and be kept all year.